The Joe Shoenfield Memorial Marathon Go Tournament held September 29th, 2001 was a huge success. It was one of the largest tournaments in North Carolina history with 28 players. We had players from Lancaster Pennsylvania and Washington, DC. We had several players from Charlotte North Carolina. Play began at 9:30 am and broke for only 1 hour for lunch, which was served at the site. 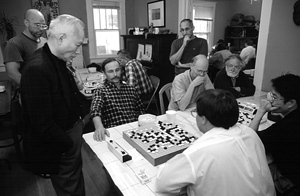 The final round, round Five, was the “Marathon Round”, so called because of the exhaustion of the players and the fact that winning this round would earn 1.5 points instead of the usual 1 point and so was important for tie-breaking purposes. 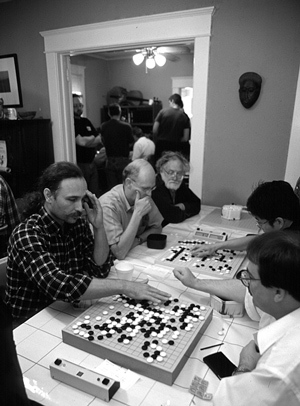 The Marathon round started at around 6pm and contained many notable games. For example, two undefeateds, Will Daland and Walter Nurmi, tangled for first place in Division C. And in Division A, Mr. Yoshiteru Suzuki and Suk Jun Kim battled for the top prize. It should be noted that Jun is one of the highest rated players in North Carolina, and made the three hour drive from Charlotte to attend (and apparently unafraid of having to give handicap stones). 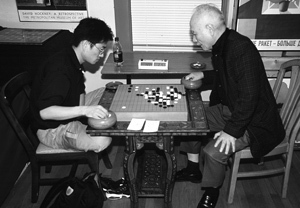 And Mr. Suzuki is a great patron of Go in the area, who has over the last few years opened a Friday evening Go club in Raleigh as part of the Japanese Amity Association. Their final game was quite exciting—I could hardly tear myself away to record results after a critical and exceedingly complex ko developed in the very early middle game. We were quite pleased to have these two players at the top of a 6 member Dan section. So why do we at Triangle Go Group feel over-the-board Go still important? For one, face-to-face Go fosters learning in ways that the quick “junk food” games on the Internet do not. I have played many games on the Internet but they pass out of the memory with no more trace than a fly momentarily alighting on your shoulder. The games literally lack depth; that is, there is a subtle, but very real importance to the tactile nature and three-dimensionality of the game. And there are other intangibles you won’t get from staring at the glowing box such as the after-tournament-game handshake, and your opponent’s explanation of the move you missed in the Joseki. And then the correction to your opponent’s analysis by the high dan player standing by watching with a smile on his face. And who can forget the epic long car ride home recounting your triumphs and blunders to your Go comrades. Naturally, facing your opponent is not all fun and games. Your computer will never eat a flaky sugar-encrusted donut while you play, or smack his gum, or wiggle the table with his foot in a room crammed with people like sardines in a hot can. However, these little annoyances do not really detract from the experience, but instead make it all the more unforgettable. And who could forget the exquisite joy of the head fake—intently studying a ridiculously unimportant corner of the board when you know you have one of those opponents that slavishly follow every move your eyes make. For all of these reasons and more should we always continue to promote and celebrate real Go played on real boards by real players. Why did we succeed in getting such a high turnout? Was it the money? Over 500 dollars in cash prizes were given to the first and second place winners in each of four divisions. Perhaps it was the novel format—five (!) rated games in one day. Perhaps it was fear of being ridiculed for the next year for having missed such a great event. Whatever the reason, the bottom line is that the format works. You can have a five-round tournament in one day. We used 45 minutes of regular time, and 30 stones in 5 minutes for Byo-Yomi. Only a handful of the nearly 140 games played were decided by time. The only changes I would make would be to go with straight round-robin pairing to make things move quicker (and avoid the inevitable questioning of the murky logic behind Swiss-McMahon “band” pairings). Another reason we succeeded is that we have a strong local Go community that made this tournament possible. Joe Berry and David Allen of our brother club (Games Galore Go Club) in Raleigh provided equipment and the manual pairing system. 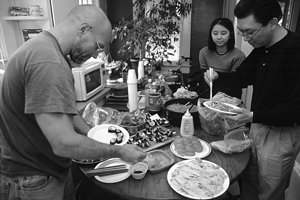 Peter Armenia and Lanya Shapiro provided food and allowed us into their home (thus avoiding fees for site rental). Dave Fruchtenicht, Charlie Alden, Frank Salantrie, and Adam Bridges provided more food and logistical support. But we did not forget that there was one member of our club missing. So who was Joe Shoenfield? Joe was an internationally respected logician and professor at Duke University. But more importantly, he was one of the founders of the Triangle Go Group. It is hard to believe, but he played Go in the Triangle area for over four decades—long, long, before Go had appeared as a fashionable prop in independent films and episodes of Ally McBeal. And every Tuesday evening he was always one of the first to arrive and one of the last to leave. He was quiet, but never shied from a debate on a subject he was interested in. He also hummed quite a bit while playing. And his persnickity attention to Go etiquette has become legend. But what I remember most about Joe was that he played all comers. And he loved to play. And that what it is all about. We hoped to create a tournament that would honor Joe's memory and foster over-the-board play and good fellowship. I think we made a good start. Pictures courtesy of Peter Armenia.